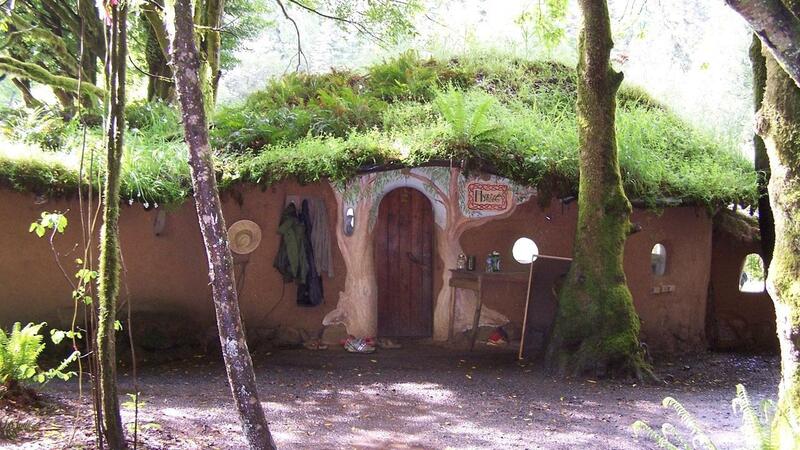 In May of 2011, I attended the “Complete Cob” workshop at the Cob Cottage Company in a coastal rainforest outside Coquille, Oregon. I went to learn about cob building technology, but ended up coming away with an experience I won't soon forget. As I stared past the blur of propellers pulling us from San Francisco to the small airport in North Bend, Oregon, I took in the patchwork landscape beneath my airplane window. There was a tapestry of rolling green mountains beneath me, with a myriad of pale patches interspersed, as if someone had taken a gigantic pair of clippers and given the mountains a bad haircut, or several. I had reached Southwest Oregon, to come face-to-face with the world’s demand for lumber and to arrive at the Cob Cottage Company, where I would gain exposure to attitudes about building altogether different from that very same world. Jori, myself and Trevor (a twenty-something workshop volunteer we picked up along the way) made our way to the school via passage through smaller and smaller towns and eventually by way of narrower and narrower roads, until the plants were almost brushing the small Honda’s windows as we crept into the coastal rainforest. This mantra would be demonstrated, both spoken and unspoken, throughout the next nine days. As my path peaked onto a flat area that would later be known as “ the meadow,” a small village of buildings and serpentine walls came into view. The first of these was “The Myrtle,” a small cottage that served as a social space, which was a jewel of construction and artistry (below and at top). I would later learn it had cost just over 200 dollars and a lot of sweat equity. The cost had been an intentional demonstration of natural building prowess, from a worldwide community that prides itself on creative ways of lowering costs, as opposed to the rest of us who seem anxious to use our housing to let everyone know how wealthy we are. The workshop had attracted a myriad of participants. There were farmers and bureaucrats, an architect and an ophthalmologist with three kids. A mechanical engineer and a Mennonite. Ages ran the gamut from seven to well into retirement. We all told our stories. Some had come to build their family home. Others a weekend cabin. Or a retirement home. Another a bed and breakfast. A man in his fifties choked up as he talked of the burden of his mortgage. I told them I had come to learn the truth about sustainable construction. That neither during my degree in Architecture nor my in certification as a “green” builder, had I come across what is known today as “natural building.” Yet these methods are not part of the latest marketing scheme. They are rooted in building technologies developed over millennia. 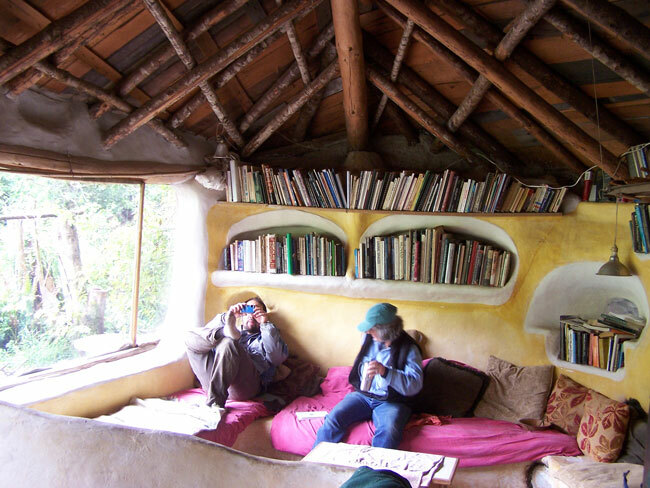 Cob technology itself hails from Southwest England, where structures upwards of five-hundred years old command high prices as weekend cottages. Having to renovate our 1970’s frame house after thirty years becomes almost laughable alongside the performance of such solid building technology. 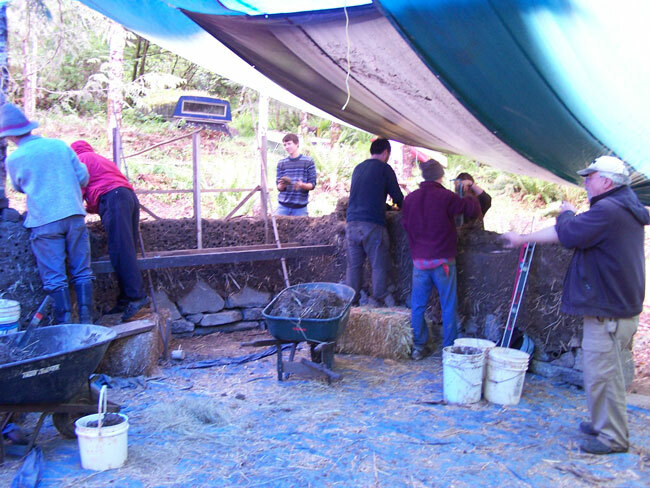 During the following nine days, our cob building site became the focal point of a truly transformative experience. In essence, we became what many would call a village. I know it probably sounds cheesy, but there’s a strange thing that happens when a group of people get together to build a structure. Barriers come down and camaraderie surfaces. 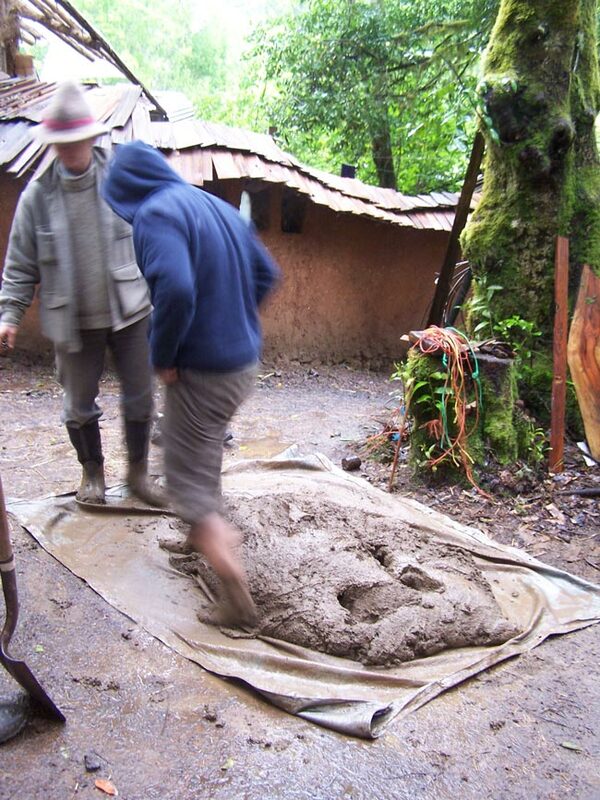 On site, we would mix the cob (starting with a mixture of high-clay soil, sand and water) by foot, partners trampling a batch on a small tarp. Along with the footwork, the tarp would be periodically pulled up on one side or another to help the ingredients intermingle. The instructors, Kiko Denzer (in above picture, on the left with a hat) and Deanne Bednar, wanted us to mix the cob without machines so that we would get an intuitive sense of how a good mix felt. When it reached the right consistency, it would quit crumbling and begin cohering into “slugs” on our tarps. Once the mixture became cohesive, it was time to add the straw, which would act as thousands of tiny tensile members within the finished wall, making it impressively strong. The straw would be stomped and rolled in using the same method. Once there was sufficient density of straw, we could begin making our cobs (cob means lump or rounded mass in old English). At some point, several teams would have batches of twenty or thirty cobs ready for application to the wall. What happened next was one of the best parts of the whole experience. Cobbers would line up in a zig-zag pattern and toss the cobs down the line until they reached someone applying them to the wall. These “cob tosses,” pitching the not-always-so-well-made cobs at each other, were a highlight of my week. If you ever attend a cob workshop, you’ll know exactly what I mean. Workshop participants work the next layer of "cobs" into the wall. The week was interspersed with many other events, both planned and unplanned, all of which made it a profound experience. I will not divulge the entirety of it here, for my goal is not to ruin the experience for you, but to let you know that it is available, should you be inclined to check it out. Click here to learn about upcoming workshops from the Cob Cottage Company and others. What kind of building technology would you like to try in a workshop? Let me know in the comments!